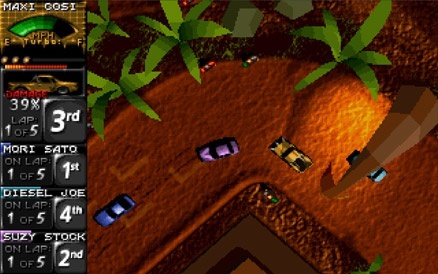 Back in the days when Death Rally was new I played the shareware version a lot. Eventually, after finishing the game with a Sentinel, I wanted more and started exploring the game files using an HEX-editor but didn't really succeed. Now, more than 10 years after, I'm still interested in modifying the game files and after seeing Doomfrost's savegame mod I know it can be done. Trying to understand how the savegames are build up and structured to modify game content. The savegames don't use plain text and every time you save, the encoding of the savegame will be different. I run Death Rally using DOSBox and started a new game, didn't sign up for a race and saved the game on the first free savegame slot. This slot will generate file DR.SG0. 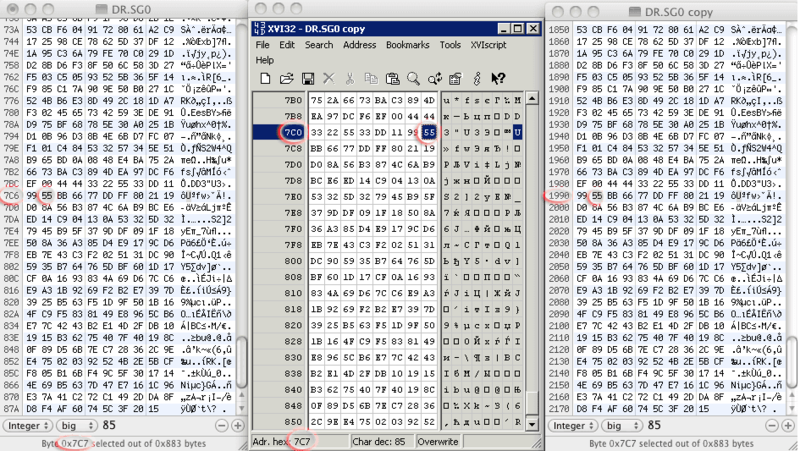 I downloaded 'Hex Fiend' (HEX-editor for Mac OS, but there are many others out there) and opened the DR.SG0 savegame. Then I started editting the savegame in 8 byte blocks. This way I could notice differences in the game (including lock-ups when loading the savegame) and find out which line in the savegame is used for certain things like playernames and rankings. After fiddling around with the values I discovered the location for Jane Honda's nickname. Because the savegame is encoded I can't just write a new name but change the hexadecimal value to something else and see what happens. Starting from this I changed every single hexadecimal value to see what would be changed. Due to this I reloaded the savegame a million times, looked at the score, players and their behavior during a game after changing one value. In case I noticed a change I tried to narrow down the change to a correct value which Death Rally understands and wrote it down. C0 192 33 ? 51 ? 2 Icon ? C1 193 23 ? 35 ? 2 Icon ? C2 194 65 ? 101 ? 2 Icon ? C4 196 77 ? 119 ? 2 Score ? C5 197 44 ? 68 ? 2 Score ? C6 198 99 ? 153 ? 2 Score ? C9 201 99 ? 153 ? 2 Ranking ? CA 202 DD ? 221 ? 2 Ranking ? 82B 2091 C9 CA 201 202 20 Upgrade Tires -1? 850 2128 2C ? 44 ? 20 Icon ? Racing against Mori Sato in a Shrieker and Diesel Joe in a Sentinel. Remember: each time you save the game the values will be different. This means that my table can't be applied onto your savegame. If you want my original savegame you can download it here: DR.SG0. You can download my slightly modified savegame in chapter 'Done it myself'. Also note that HEX-editors can vary a bit so get to know your version of your HEX-editor. 9. Load up your game, start a race and hope that player 19 will participate. Using my DR.SG0 file along with the example above will change Farmer Ted's Vagabond to a Dervish. As you can see there is a pattern in hexadecimal values and if you're familiar with it you won't have to use the hexidecimal/binary converter. Of course you can always try to "just fill something in and see what happens" but this is most likely to fail. Especially with the cars because these values have to be exact (with color, money, nicknames you have more 'freedom'). The trick is to find what everything means. I noticed that the savegame works in blocks of 108 bytes. See the table for example; 371 and 479 change cars for respectively player 4 and 5. This means that 479 + 108 (= 587) will change the car of player 6. Unfortunately this system is not 100% correct as there is just 103 between player 18 and 19. - Car values are exact. Increase the binary value by 8 to get a faster car, decrease by 8 for a slower car (Starting from Vagabond and up to Deliverator). - Be careful when defining to much cars of the same type. You need enough cars to fill up one type of race (i.e. Easy, Normal and Hard Races) otherwise Death Rally will crash. This means it's safe to give Farmer Ted a Dervish (he can participate in Easy and Normal race) but it's dangerous to give all the Deliverator and Wraith racers a Dervish because there aren't enough players left over for the Hard Race. One more thing: you need more than 4 cars that can race with the Hard Race because sometimes a player is not selected for participation. It's safer to have at least 6 players that can participate in each type of race. - Money and color is defined by up to 3 locations in the file. For instance byte 192, 193 and 194 are used to define the colors for player 2 and you can de/increase 192 by some value but can't do so with 193 and 194. You'll need a different one. - There are 'weird' values like refund-value of your car. I haven't located them yet and are only interesting to fill out the gaps in the savegame. Especially for AI players because they don't care about money. - Mad Mac upgraded to Deliverator. Modified players, ain't it nice to see a silver Dervish? I would really be interested in seeing this go further. I always wanted different colors for my cars, as the player selection and naming system are very good already. Let me know if you've uncovered anything new!! A while ago I was thinking about diving deeper into this. I'm not sure if I can discover the encryption method of the savegame (although I know it involves date/time as a variable). It would be nice to create a program that can modify settings. If I have more information I'll post it . If your like this tools please, star my repo. Interesting stuff, I am the guy that helped Doomfrost spread his mod on the internet, back in the day. I am trying to get the Adversary's car, but it looks like it's not an easy feat. I remember someone managed to did that back in the day, even though car controls were bugged. Did you manage to get that car with the hex editor? I didn't get the Adversary's car using a hex editor. Cool that you've managed to get it! Can you upload the file again? The uploadlink has expired. I just wish I could find a way to get the all of the tracks to not be limited to just Easy Medium Hard. All I can basically do for right now is reorder the track listings in a memory editor. Which has made maps like Suburbia show up in Hard listing. Sounds interesting! Can you shed light some extra light on the way you reorder the tracks using a memory editor? I'd like to know more about that subject . Guys...someone needs to create a game editor for death rally...PLEASE one of you geniuses out there do it. I love death rally and wish it had different starts every time i load it. 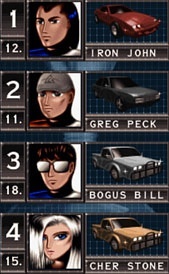 Player rankings, cars they start with, etc...it would be REALLY cool if people upgraded their cars on wins too. But for now keep it simple. Yeah but I don't know anything about Python or how to run those files at github. Can someone simplify an editor for stupid people like me? Thanks to Enrique's project (and tools), and to this article I've done a little savegame editor (Italian and English Version). Usage: copy file into DR folder and launch it. Known bugs: for certain values of key byte (maybe less than 64? ), savegame loads odd values. Try to save game from DR again and reload file into editor. 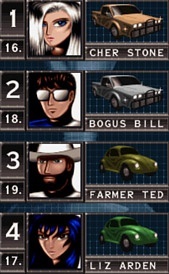 - if you assign a Vagabond to all drivers, you can have fun things such as, for example, Bogus Bill, Cher Stone and Duke Nukem in the same Hard Race. This reply has been editted 1 time. Can I publish your util in my page www.dreerally.com? Also, thank you again for your tools and project. I've downloaded your savegame, but the size isn't 2179 bytes, so loading it in the game doesn't work. The DR.SW6 savegame is for the shareware version of Death Rally. Great work getting the Adversary's car in that version! Never thought that the Adversary's car would steer that bad! But it's fast and tough, however . I fixed your image by the way, Simo . Mirror of the DR.SW6 file: DR.SW6. This reply has been editted 4 times. The Adversary's car lasts only one race, but great work anyway! I publish on my website a f1 2018 mod savegame for death rally. I hope you enjoy it! This reply has been editted 2 times. Below I write a consideration about your mod, that can be useful also in this topic. Quote: "Driver face image can be repeated because at this moment we can’t change the faces to substitute with the real faces." Maybe yes, they could be changed. I'm testing your bpk file algorithm from tools (I'm looking at the BPK algorithm for track BPAs), but in addition to the wrong palette, I can only decrypt part of the image (the first GIF block I think). However, in DreeRally the images are seen well, so you should have the updated and correct algorithm (in your dr.c source seems a LZW/GIF decompression with modified palette). The idea would be to extract BPK from the BPA, convert it into a gif image, modify it, reconvert it into BPK and store it again in the BPA, keeping the size of the entire BPA file unchanged. Sorry for the Anonymous mistake the message above is mine. Firstable, comments have been fixed in my blog now thanks. About the BKP files we have a problem. 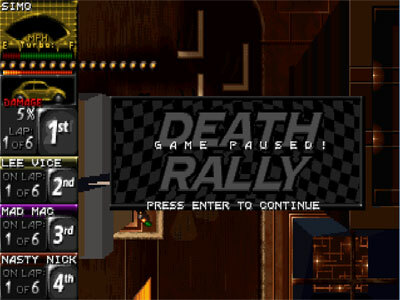 I know that the palette is worng in my tool but if you want to put a custom image in Death Rally probably you need to change the palette, and as far as I know the Death Rally palettes are used too much. When I decompile I see that the same palette (256 colours) is used for faces, cars, menus and more, so I think it's difficult to change bkp files correctly. Yes, but it's also true that if you launch your DreeRally executable, the images are shown correctly as stated also in the screenshot of your project . So you have, even if "indirectly", a functional BPK decode algorithm for entire images. In other words, you can decode an image with its correct "shape" only with wrong colors. Can these considerations described at this external link be useful to you? I'm trying also an "inverse deduction" : if you take a screenshot from the game and cut out pixels of sprite for example for Sam Speed face, then save it in BMP format so you have the correct solution of which color should result in that particular pixel, and from here, BPK file and PAL file, deduce correct bit transformation. Excellent work! Can't wait 'till you publish the how-to next week . In the past I've also seen a screenshot with a player against the Adversary in one of the regular maps. In other words: play the final round in any other map than the Arena. Would that be the next challenge to achieve in savegame modding? This situation cannot be achieved with a savegame, we need to make a trainer or something like that to modifing the executable in run time. http://www.dreerally.com/ because in few weeks you have great news about that! After several tries, a small but maybe important mod in game. follow updates on www.dreerally.com. A new death rally editor and launcher are released!